Every restorer faces this problem at least once (more often than that, usually) in every project: a stud or mounting fastener breaks off during removal. Usually this happens because of rusted-on nuts or just rust in general, but occasionally the breakage can be due to metal fatigue. It doesn't matter, really, because the end result is the same: a broken stud that needs replacement. Removing the V8 emblem from the valence was a simple matter of loosening two nuts on the emblem. 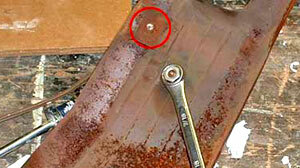 The red circle shows the stud broken when the valence was removed. 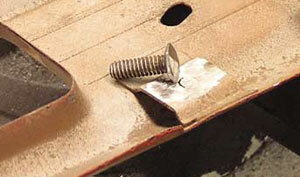 Fix or replace broken studs or mounting fasteners right away! Don't tell yourself you'll do it later. You will forget to do it and then be reminded later, when you attempt to reassemble things. This typically results in delayed projects. You will probably not notice the broken piece while you are performing the finishing steps on a body part, resulting in having to refinish it because of the damage to the paint caused by the repair. You will be tempted to do a less than adequate repair on the part because you are in a hurry to put it on, resulting in failure later. In the case of this sheet metal valence panel, we broke off a pressed-in stud that is mounted to a thin sheet metal platform welded to the valence. Therefore, you have two choices as to how to replace the stud: 1) you could grind out the little flange, punch out the stud and replace it, then weld in the platform or 2) grind down the stud itself and weld a new one on top. This is the new stud...just a bolt with the head ground down to where it's just thick enough to hold the bolt when welded to the valence. We would recommend the latter course of action, since you don't have to worry about lining up the platform and figuring out a way to hold it while welding. That said, go ahead and grind away until the broken stud is level with the platform (we assume you have a grinder or a grinding wheel.) While you're at it, find an equal-size bolt to use as a replacement and grind down the head until it's a thin "mounting platform" itself. 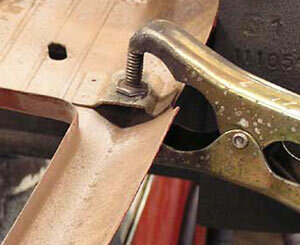 In this case, the ground clamp for the welder also served as a clamp to hold the stud in place while welding. Of course, it'll not always be this simple. Okay, since this is a beginners' article we know you probably don't have a welder. However, the chances are you have a friend who owns one, so here's the trick to hold the replacement stud in place while it's being welded: use the welder's clamp as the hold-down device. Cool, eh? If you don't know anyone with a welder you'll have to go to a shop, of course. On the other hand, you could epoxy the new stud on, provided there's enough surface area for the epoxy to "grab" and all other conditions of the materials are met. The point of this whole exercise is to show that almost anything can be fixed. It's just a case of thinking it out. New stud welded into place. I might suggest protecting the threads on the replacement stud. There are a couple simple ways of doing this: 1. You could just thread a nut down the shaft and weld beneath it. Or, 2, You could slip a short section of copper tubing over the threads. 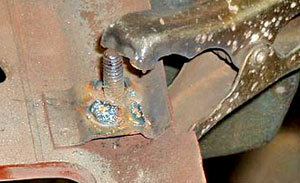 Weld won't stick to the copper and it's easily removed after attaching the stud.